CartoWeb siap digunakan dan komprehensif dan Web-GIS (Sistem Informasi Geografis) serta kerangka kerja yang nyaman untuk membangun aplikasi canggih dan disesuaikan. Dikembangkan oleh Camptocamp SA, itu didasarkan pada mesin UMN MapServer dan dirilis di bawah GNU General Public License (GPL). Ditulis menggunakan bahasa PHP5 inovatif, CartoWeb adalah berkat sangat modular dan dapat dikustomisasi untuk arsitektur berorientasi objek. Ini berjalan merata pada Windows atau platform Unix-like dan menunjukkan kekuatan yang sesungguhnya bila terkait dengan PostgreSQL / PostGIS. 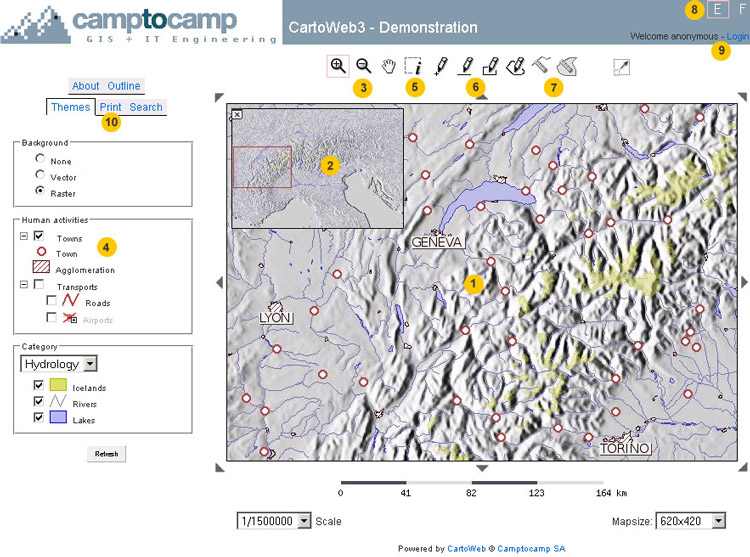 Several demos are available to demonstrate the range of functionalities that CartoWeb3 offers. Don't hesitate to try all those tools. This demo gives an overview of CartoWeb common functionalities: browsing, querying, outlining, recentering, layers management, tabs browsing and PDF printing as well as its AJAX capability. PDF map extent is defined using our new "WYSIWYG" DHTML tool. The AJAX mode is activated in this demo: the map is updated without reloading the whole page, making the browsing even more fluid. Users roles management is also demonstrated: as an example, you will have to be logged in (username: demo / password: demo) to be able to print PDF maps. Click here to visit the overall demo. Click here to visit the plugins demo. 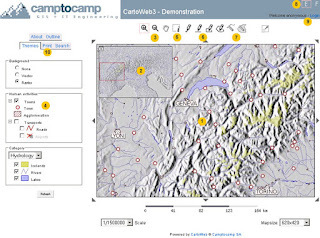 This demo demonstrates the high level of layout customization that is available with CartoWeb as well as some functionalities described in previous demos. Geographic data are kindly provided by Cartosphere. Please note that this demo is not included in CartoWeb distributions. Click here to visit the CS demo. Editing functionalities are available only to logged-in users (username: demo / password: demo). Click here to visit the editing demo. This demo gives an example of geostatistical data representation on a map (choropleth layers). Click here to visit the geostat demo. Click here to visit the basic demo. This is the default CartoWeb layout with features activated by default when you install CartoWeb. It is mainly used as a development project. Simple but comprehensive, it will be however a good start for many of your own projects. Some functionalities are only available when logged in (use for instance username: x / password: x). Click here to visit the development demo.